WHEN March comes, the caterpillars reared in domesticity never cease processioning. Many leave the greenhouse, which remains open; they go in search of a suitable spot for the approaching metamorphosis. This is the final exodus, the definite abandonment of the nest and the pine-tree. The pilgrims are much faded, whitish, with a few russet hairs on their backs. On the 20th of March I spend a whole morning watching the evolutions of a file some three yards in length, containing about a hundred emigrants. The procession toils grimly along, undulating over the dusty ground, where it leaves a furrow. Then it breaks into a small number of groups, which crowd together and remain quiescent save for sudden oscillations of the hind-quarters. After a halt of varying duration, these groups resume their march, henceforward forming independent processions. They take no settled direction. This one goes forward, that one goes back; one turns to the left and another to the right. There is no rule about their marching, no positive goal. One procession, after describing a loop retraces its steps. Yet there is a general tendency towards that wall of the greenhouse which faces the south and reflects the sun's rays with added fervour. The sole guide, it would seem, is the amount of sun which a place obtains; the directions whence the greatest heat comes are preferred. After a couple of hours of marching and countermarching, the fragmentary processions, comprising each a score of caterpillars, reach the foot of the wall. Here the soil is powdery, very dry, easy to burrow in, although made somewhat firmer by tufts of grass. The caterpillar at the head of the row explores with his mandibles, digs a little, investigates the nature of the ground. The others, trusting their leader, follow him with docility, making no attempts of their own. whatever the foremost decides will be adopted by all. Here, in the choice of a matter so important as the spot whereat the transformation shall take place, there is no individual initiative. There is only one will, the leader's. There is only one head, so to speak; the procession may be compared with the chain of segments of an enormous worm. Finally some spot is recognized as propitious. The leading caterpillar halts, pushes with his head, digs with his mandibles. The others, still in a continuous line, arrive one by one and likewise come to a halt. Then the file breaks up into a swarming heap, in which each of the caterpillars resumes his liberty. All their backs are joggling pell-mell; all their heads are plunged into the dust; all their feet are raking, all their mandibles excavating the soil The worm has chopped itself into a gang of independent workers. An excavation is formed in which, little by little, the caterpillars bury themselves. For some time to come, the undermined soil cracks and rises and covers itself with little mole-hills; then all is still. The caterpillars have descended to a depth of three inches. This is as far as the roughness of the soil permits them to go. In looser soil, the excavation would attain a much greater depth. The greenhouse shelf, supplied with fine sand, has provided me with cocoons placed at a depth of from eight to twelve inches. I would not assert that the interment might not be made still lower down. For the most part, the burial is effected in common, by more or less numerous clusters and at depths which vary greatly, according to the nature of the soil. A fortnight later, let us dig at the point where the descent underground was made. Here we shall find the cocoons assembled in bunches, cocoons of sorry appearance, soiled as they are with earthy particles held by silken threads. When stripped of their rough exterior, they are not without a certain elegance. They are narrow ellipsoids, pointed at both ends, measuring twenty-five millimetres in length and nine millimetres by .351 inch.--Translator's Note. in thickness. The silk of which they are composed is very fine and of a dull white. The fragility of the walls is remarkable when we have seen the enormous quantity of silk expended on the construction of the nest. A prodigious spinner where his winter habitation is concerned, the caterpillar finds his glands exhausted and is reduced to the strictly necessary amount when the time comes for making the cocoon. Too poor in silk, he strengthens his flimsy cell with a facing of earth. With him it is not the industry of the Bembex, The Hunting Wasps: chaps. xiv to xvii.--Translator's Note. who inserts grains of sand in her silky web and makes a solid casket of the whole; it is a summary sort of art, devoid of delicacy, which just casually sticks together the surrounding earthy refuse. Moreover, if circumstances demand it, the Pine Caterpillar can do without earth. In the very midst of the nest I have sometimes--very rarely, it is true--discovered cocoons which were perfectly clean. Not a scrap of alien matter defiled their fine white silk. I have obtained similar specimens by placing caterpillars under a bell-glass in a pan provided only with a few pine-twigs. Better still an entire procession, a good-sized one too, gathered at the opportune moment and enclosed in a large box containing no sand nor any material whatever, spun its cocoons with no other support than the bare walls. These exceptions, provoked by circumstances in which the caterpillar is not free to act according to his wont, does not in any way invalidate the rule. To prepare for the transformation, the Processionary buries himself, to the depth of nine inches and more, if the soil permit. Here a curious problem forces itself upon the observer's mind. How does the Moth contrive to ascend from the catacombs into which the caterpillar has descended? Not in the finery of her perfect state--the big wings with their delicate scales, the sweeping antenna-plumes--dare she brave the asperities of the soil, or she would issue thence all tattered, rumpled and unrecognizable. And this is not the case: far from it. Moreover, what means can she employ, she so feeble, to break the crust of earth into which the original dust will have turned after the slightest of showers? 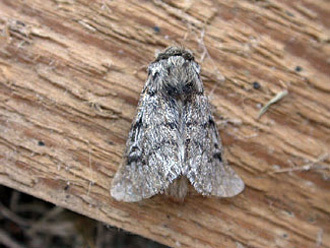 The Moth appears at the end of July or in August. The burial took place in March. Rain must have fallen during this lapse of time, rain which beats down the soil, cements it and leaves it to harden once evaporation has set in. Never could a Moth, unless attired and equipped with tools for the purpose, break her way through such an obstacle. She would perforce require a boring-tool and a costume of extreme simplicity. Guided by these considerations, I institute a few experiments which will give me the key to the riddle. In April I make a copious collection of cocoons Of these I place ten or twelve at the bottom of test-tubes of different diameters and last of all, I fill the apparatus with sandy soil, sifted and very slightly moistened. The contents are pressed down, but in moderation, for fear of injuring the cocoons below. When the month of August comes, the column of earth, damp at the outset, has set so firmly, thanks to evaporation, that, when I reverse the test tube, nothing trickles out. On the other hand, some cocoons have been kept naked under a metallic cover. These will teach me what the buried cocoons would not be able to show. They furnish me, in fact, with records of the greatest interest. On issuing from the cocoon, the Pine Bombyx has her finery bundled up and presents the appearance of a cylinder with rounded ends. The wings, the principal obstacle to underground labour are pressed against the breast like narrow scarves; the antenn?, another serious embarrassment, have not yet unfolded their plumes and are turned back along the Moth's sides. The hair, which later forms a dense fleece, is laid flat, pointing backwards. The legs alone are free, fairly active and endowed with a certain vigour. Thanks to this arrangement, which does away with all awkward projections, the ascent through the soil is made possible. True, every Moth, at the moment of quitting her shell, is this sort of swathed mummy; but the Pine Bombyx has in addition an exceptional aptitude rendered necessary by the fact that she hatches under the ground. While the others, once out of the cocoon, hasten to spread their wings and are powerless to defer their development, she, by virtue of an indispensable privilege, remains in her compact and wrapped-up condition as long as circumstances demand it. Under my bell-glasses I see some who, though born upon the surface, for twenty-four hours drag themselves over the sand or cling to the pine-branches, before untying their sashes and unfurling them as wings. This delay is evidently essential. To ascend from beneath the earth and reach the open air, the Moth has to bore a long tunnel, which requires time. She will take good care not to spread her finery before emerging, for it would hamper her and would itself be rumpled and badly creased. Therefore the cylindrical mummy persists until the deliverance is effected; and, if liberty happen to be acquired before the appointed moment, the final evolution does not take place until after a lapse of time in conformity with usage. We are acquainted with the equipment for emergence, the tight-fitting jerkin indispensable in a narrow gallery. Now, where is the boring-tool? The legs, though free, would here be insufficient: they would scrape the earth laterally, enlarging the diameter of the shaft, but could not prolong the exit vertically, above the insect's head. This tool must be in front. Pass the tip of your finger over the Moth's head You will feel a few very rough wrinkles. The magnifying-glass shows us more We find, between the eyes and higher up four or five transversal scales, so set as to overlap one another; they are hard and black and are trimmed crescent-wise at the ends The longest and strongest is the uppermost, which is in the middle of the forehead, There you have the centre-bit of your boring-tool. My test-tubes, learned master, will tell us. By good fortune, of the numerous Moths ascending from the bottom of my apparatus through a column of sand solidified by the evaporation of the original moisture, some are making their way upwards against the side of the tube, enabling me to follow their manoeuvres. I see them raising their cylindrical bodies, butting with their heads, jerking now in one direction, now in another The nature of their task is obvious. The centre-bits, with an alternating movement, are boring into the agglutinated sand. The powdery wreckage trickles down from overhead and is at once thrust backward by the legs. A little space forms at the top of the vault; and the Moth moves so much nearer to the surface. By the following day, the whole column, ten inches in height, will be perforated with a straight, perpendicular shaf­t. Shall we now form an idea of the total work performed? Let us turn the test-tube upside down. The contents, as I have said, will not fall out, for they have set into a block; but from the tunnels bored by the Moth trickles all the sand crumbled by the crescents of the drill. The result is a cylindrical gallery, of the width of a lead-pencil, very cleanly cut and reaching to the bottom of the solid mass. Are you satisfied, my master? Do you now perceive the great utility of the scaly stairs? Would you not say that we have here a magnificent example of an instrument superlatively fitted for a definite task? I share this opinion, for I think, with you, that a sovereign Reason has in all things coordinated the means and the end. But let me tell you: we are called old-fashioned, you and I; with our conception of a world ruled by an Intelligence, we are quite out of the swim. Order, balance, harmony: that is all silly nonsense. The universe is a fortuitous arrangement in the chaos of the possible. What is white might as easily be black, what is round might be angular, what is regular might be shapeless and harmony might just as well be discord. Chance has decided all things. Yes, we are a pair of prejudiced old fogeys when we linger with a certain fondness over the marvels of perfection. Who troubles about these futilities nowadays? So-called serious science, the science which spells honour, profit and renown, consists in slicing your animal with very costly instruments into tiny circular sections. My housekeeper does as much with a bunch of carrots, with no higher pretention than to concoct a modest dish, which is not an invariable success. In the problem of life are we more successful when we have split a fibre into four and cut a cell into shavings? It hardly seems so. The riddle is as dark as ever. Ah, how much better is your method, my dear master; above all, how much loftier your philosophy, how much more wholesome and invigorating! Here at last is the Moth at the surface. With the deliberate slowness demanded by so delicate an operation, she spreads her bunched wings, extends her antenn? and puffs out her fleece. Her costume is a modest one: upper wings grey, striped with a few crinkly brown streaks; under-wings white; thorax covered with thick grey fur; abdomen clad in bright-russet velvet. The last segment has a pale-gold sheen. At first sight it appears bare. It is not, however; but, in place of hairs like those of the other segments, it has, on its dorsal surface, scales so well assembled and so close together that the whole seems to form a continuous block, like a nugget. Let us touch this trinket with the point of a needle. However gently we rub, a multitude of scales come off and flutter at the least breath, shining like mica spangles. Their concave form, their shape, an elongated oval, their colouring, white in the lower half but reddish gold in the upper, give them, if we allow for the difference in size, a certain resemblance to the scales surrounding the heads of some of the centaury tribe. Such is the golden fleece of which the mother will despoil herself in order to cover the cylinder of her eggs. The nugget of her hind-quarters, exfoliated spangle by spangle, will form a roof for the germs arranged like the grain in a corn-cob. I was anxious to watch the actual placing of these pretty tiles, which are fixed at the pale end with a speck of cement, leaving the coloured end free. Circumstances did not favour me. Inactive all day, motionless on some needle of the lower branches, the Moth, whose life is very short, moves only in the darkness of the night. Both her mating and egg-laying are nocturnal. On the morrow, all is finished: the Bombyx has lived. Under these conditions, it was impossible, by the doubtful beams of a lantern, to follow satisfactorily the labour of the mother on the pine-trees in the garden. I was no more fortunate with the captives in my bell-glasses. A few did lay their eggs, but always at a very advanced hour of the night, an hour which found my vigilance at fault. The light of a candle and eyes heavy with sleep were of little avail when it came to analysing the subtle operations of the mother as she puts her scales in place. We will say nothing of the little that was imperfectly seen. Let us close with a few words of sylvicultural practice. The Pine Processionary is a voracious caterpillar who, while respecting the terminal bud, protected by its scales and its resinous varnish, completely denudes the bough and imperils the tree by leaving it bald. The green pine-needles, that mane in which the vegetable vigour of the tree resides, are shorn to the roots. How are we to remedy this? When consulted on the subject, the forest-ranger of my parish told me that the custom is to go from tree to tree with pruning-shears fitted on a long pole and to cut down the nests, afterwards burning them. The method is a troublesome one, for the silken purses are often at considerable heights. Moreover, it is not without danger. Attacked by the hairy dust, the destroyers soon experience intolerable discomfort, a torture of irritation which makes them refuse to continue the work. To my thinking it would be better to operate before the appearance of the nests. The Pine Bombyx is a very bad flyer. Incapable of soaring, almost like the Silk-moth, she flutters about and blunders to earth again; and her best efforts barely succeed in bringing her to the lower branches, which almost drag along the ground. Here are deposited the cylinders of eggs, at a height of six feet at most. It is the young caterpillars who, from one provisional encampment to another, gradually ascend, attaining, stage by stage, the summits upon which they weave their final dwellings. Once we grasp this peculiarity, the rest is plain sailing. In August we inspect the lower foliage of the tree: an easy examination, for it is carried on no higher than our heads. Towards the far end of the twigs it is easy to espy the Bombyx' eggs, packed into cylinders that resemble scaly catkins. Their size and their whitish colour make them show up amid the sombre green. Gathered with the double pine-needle that bears them, these cylinders are crushed under foot, a summary fashion of stamping out an evil before it spreads. This I have done in the case of the few pine-trees in my enclosure. And the same might be done in the wider forest expanses and more especially in parks and gardens, where symmetrical foliation is one of the great beauties of the tree. I will add that it is wise to prune every bough that droops to earth and to keep the foot of the conifer bare to a height of six feet or so. In the absence of these lower stairs, the only ones that the Bombyx with her clumsy flight can reach, she will not be able to populate the tree.